The last chart analysis for the TSX Index showed it stuck in a lateral trading band with support at 12,600 and resistance at 12,900. That all ended on Wednesday in a big way when the tall dark candlestick crashed through two support levels: 12,600 and 12,500. The trading action today confirmed the near-term downtrend with an open and close below the close for the ominous tall dark candlestick. The TSX Index now has a new major resistance level of 12,500 (reversal of roles) which was a prior major support level. If the TSX Index cannot hold the support zone, there is a high probability of a test of the November low around 11,800. If you read my previous posts, this surprise drop on Wednesday should come as no surprise. Material and oil related stocks, which represent 45% of the TSX Index, have performed very poorly. Reference a recent post on Dr. Copper. U.S. Jobs Report will move the market on Friday: most likely to the downside. 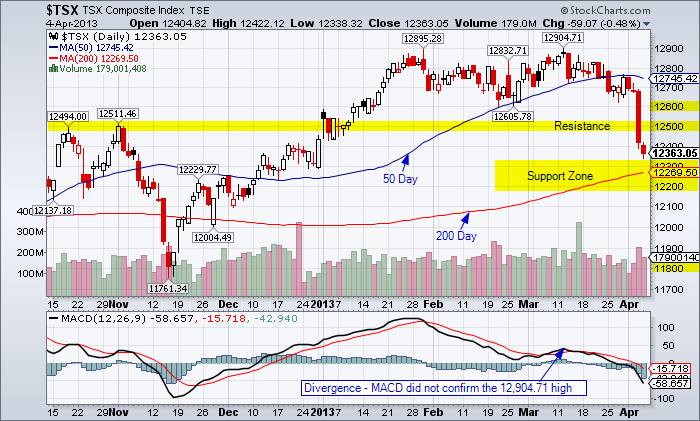 This entry was posted in TSX Index and tagged MACD, major support, near-term trend, TSX on April 4, 2013 by Trader. With a weighting of 27.88% in the S&P/TSX Composite Index, the energy sector holds the key (along with materials—16.88%) for the continuation of the uptrend in the index. But with the underlying commodities, including oil and natural gas, not breaking out to the upside; it is hard to be optimistic. And then there is the frustrating Canadian crude oil differential due in part to pipeline constraints. The differential compared to world oil prices (Brent) is around $50.00 per barrel. Canada imports around 40% of the oil it consumes. So eastern Canada is paying world prices for crude and western Canada is losing $1.5-billion a month because of the differential. The oil visionaries out west, with the “let eastern Canada freeze in the dark mentality”, were not the great oracles. Who needed to ship oil to the east when our friends to the south would take all we could produce out west? You have the answer today and there is no easy solution. Pipelines cannot be built in a day and the U.S. is able to squeeze more and more out of their wells due to advances in drilling technology—hydraulic fracturing. The financials, with a weighting of 29.62%, have done the heavy lifting and are up over 19% from the November, 2012 low. But the financial sector is close to major resistance levels and is due for a consolidation or correction. 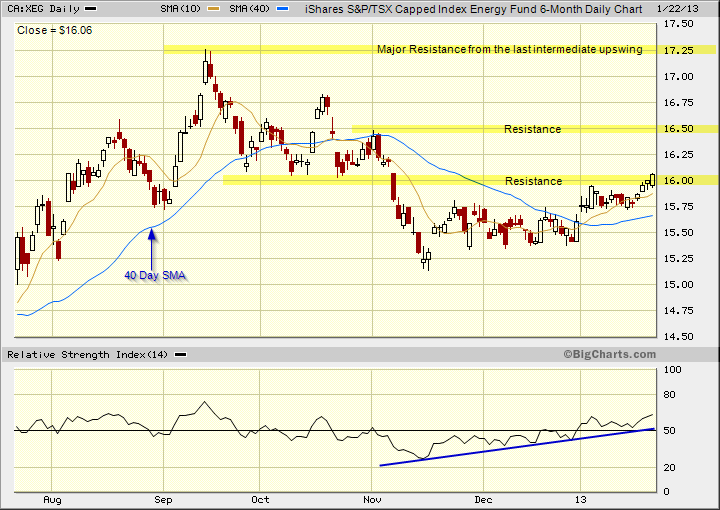 XEG – S&P/TSX Capped Energy Index Fund – Suncor represents 18.60% of this fund. Note: Click on HOME for updated postings. This technical analysis is for educational purposes so you can learn to trade online using candlestick charts and other technical indicators including volume, moving averages and oscillators. Please conduct your own chart analysis or consult your financial advisor before making investment decisions. The chart snippet is from BigCharts.com which I recommend and have used for fifteen years. The author of this article may hold long or short positions in the featured stock or index. This entry was posted in Stocks and tagged chart analysis, near-term trend, TSX, XEG on January 22, 2013 by Trader. The near-term trend is up for the 10-year note which represents the movement of capital from the relative safety of the U.S. Treasury to other asset classes. The S&P 500 Index at 1,446 is above resistance levels of 1,425 and 1,440 with the financial sector being a big winner. There is hope that the U.S. will not drive over the so-called fiscal cliff as politicians do what they do best: talk with no action. But hope will not sustain the advance in stocks and the U.S. Treasury for much longer. Some sort of resolution to the fiscal mess would see the yield breakout above resistance of 1.90% and a continuation of the near-term uptrend in major U.S. stock indexes. But and there is always a but when you trade online, the major trend is still down for the U.S. Treasury and the intermediate trend is sideways. For the TSX Index (weighted to oil and material stocks) it would take a confirmed resolution of the fiscal cliff and some good economic numbers out of China to move this Canadian index. And even this may not do the job as caution is the prevailing mood as we end 2012 and will be the prevailing mood as we enter 2013. It has been a dismal three year performance for the TSX Index relative to the U.S. Indexes. 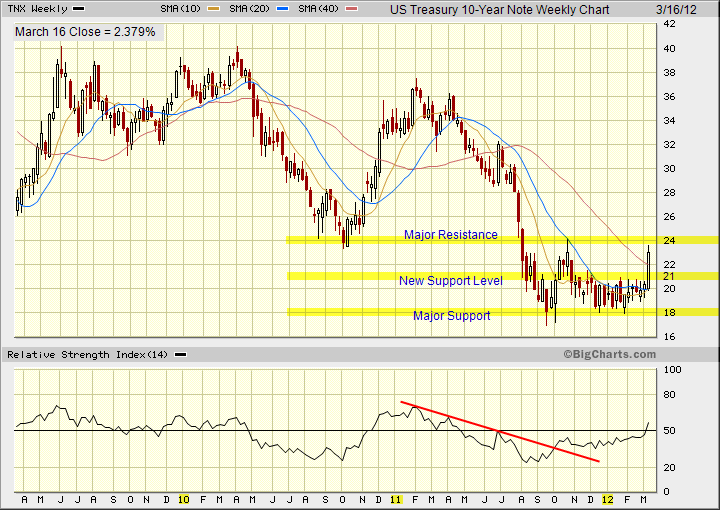 Reference the last chart analysis for the this U.S. Treasury Note. This entry was posted in U.S. Indexes and tagged chart analysis, near-term trend, resistance, TSX on December 18, 2012 by Trader. The resistance level for the VIX is 20. 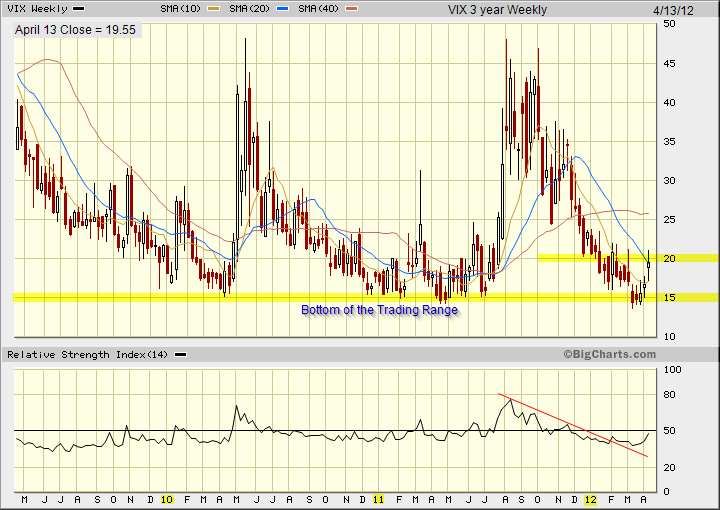 This entry was posted in U.S. Indexes and tagged candlestick charts, near-term trend, VIX on April 13, 2012 by Trader. The intermediate trend for copper is sideways and the near-term trend is down. There was a tentative break of the $3.70 support level. In this case, I am using a 3% filter to confirm the break so I am looking for a close of $3.59 to move from tentative to confirmed. Reference the last chart analysis of copper posted on March 30, 2012. 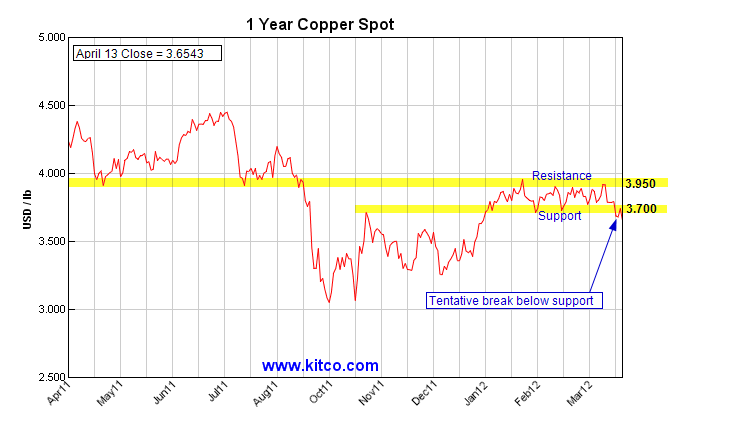 This entry was posted in Other Topics and tagged copper, near-term trend, support on April 13, 2012 by Trader. 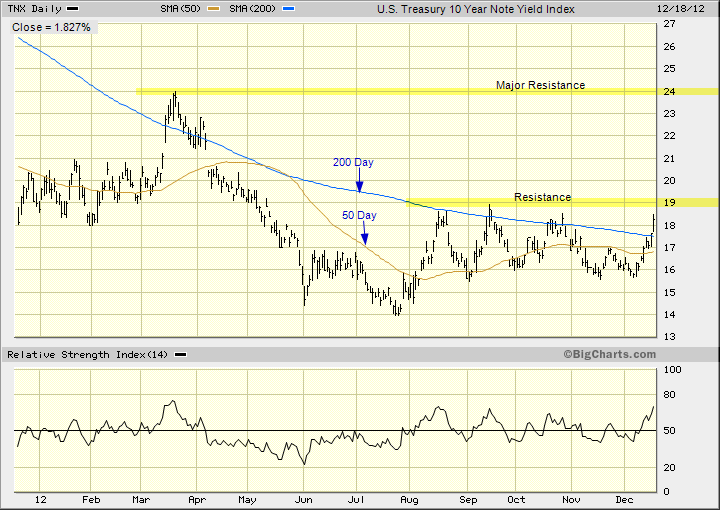 U.S. Treasury 10-year note has been trading in an intermediate lateral band of 1.80% to 2.10% for the past six months. The reversal of roles is an important concept in technical analysis and the old resistance level of 2.1% is now the new support level. Can the index breakout above 2.4% which is a major resistance level that was tested last October? Or will the TNX ease into another lateral trading band with 2.10% as the new support level? Reference the last chart analysis for the 10-year treasury based on the weekly chart when it was unable to break the resistance level of 2.40% last October. This entry was posted in U.S. Indexes and tagged candlestick chart, major support, near-term trend, resistance on March 16, 2012 by Trader. The above weekly chart at the close of trading for the week January 16, 2012 shows the near-term uptrend for the TSX Index with resistance at 12,500. The weekly volume is increasing which bodes well for a continuation of the trend and a break at 12,500. But the intermediate trend is sideways and below the 200 day moving average. Caution is advised before making any major commitments to this short-term rally. The performance of the TSX pales in comparison to the DJIA which is trading above the 200 day simple moving average and ready to test major resistance. On Monday, January 23, 2012; the TSX Index made a tentative close above resistance of 12,500. But you should apply both a price and time filter to confirm the break. A reasonable price filter for the index would be a 1% to 2% break with a time filter of two days. Then 12,500 would be the new support level. The reversal of roles from resistance to support or support to resistance is an important concept in technical analysis. On Tuesday, January 24, 2012; the TSX Index closed below the resistance level of 12,500. Needless to say, this is not a positive development. At this time, there is no need to chase the near-term rally as the so called “fast money” made an exit at the 12,500 level. On Wednesday, January 25, 2012; the TSX Index closed at 12,539 with a bullish engulfing pattern on the daily chart. The volume was above average and OBV and RSI are both trending up. The fundamental news driving the market is the Fed statement confirming low interest rates and the renewed hope of a deal in Greece with the private lenders. Now there has to be follow-through on Thursday. I am looking for a confirmed break above resistance of 12,500 as per the price and time filters. On Thursday, January 26, 2012; the TSX Index closed at 12,462 after reaching an intra-day high of 12,615. Where is the follow-through? The failure to hold above the resistance level of 12,500, for the second time this week, after an encouraging start to the session does not bode well for the continuation of the near-term uptrend. The selling pressure in the financials, both banks and lifecos, was a standout among the decliners. There was some negative economic data out of the US and this was the cue for the traders to take some profit. Always look at the market reaction to any news event. It does not matter what I think or you think about the news event: the only thing that matters is the market reaction. And traders are selling into the short-term rally which was dominated in Canada by the financials and energy. The TSX is still in an intermediate lateral trading band: it has gone nowhere in comparison to the DJIA. Take your cue from the charts. On Friday, January 27, 2012; the TSX Index closed at 12,466. It was unable to break resistance at 12,500 this week. Now, you need to complete your own daily analysis of the TSX Index using the advanced settings for BigCharts which are detailed on this site. 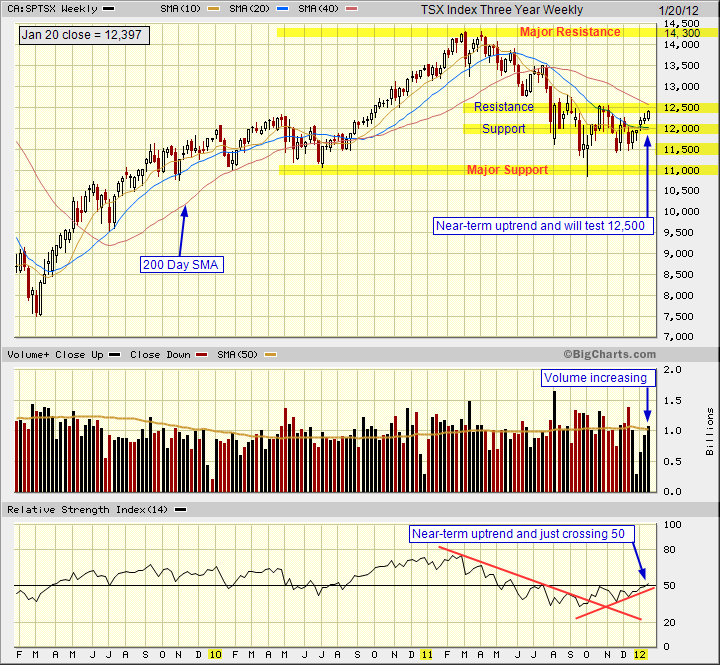 Please review last weeks chart analysis for the TSX Index. This entry was posted in TSX Index and tagged candlestick chart, near-term trend, resistance, TSX on January 22, 2012 by Trader. Near-term uptrend for RBC: Can it break $52.00? Chart for the Royal Bank of Canada shows the near-term uptrend with resistance at the 200-day simple moving average of $52.00. If the stock can break and hold above $52.00 for two days, this point will become the new support level. The reversal of roles from resistance to support or support to resistance is an important concept in technical analysis. 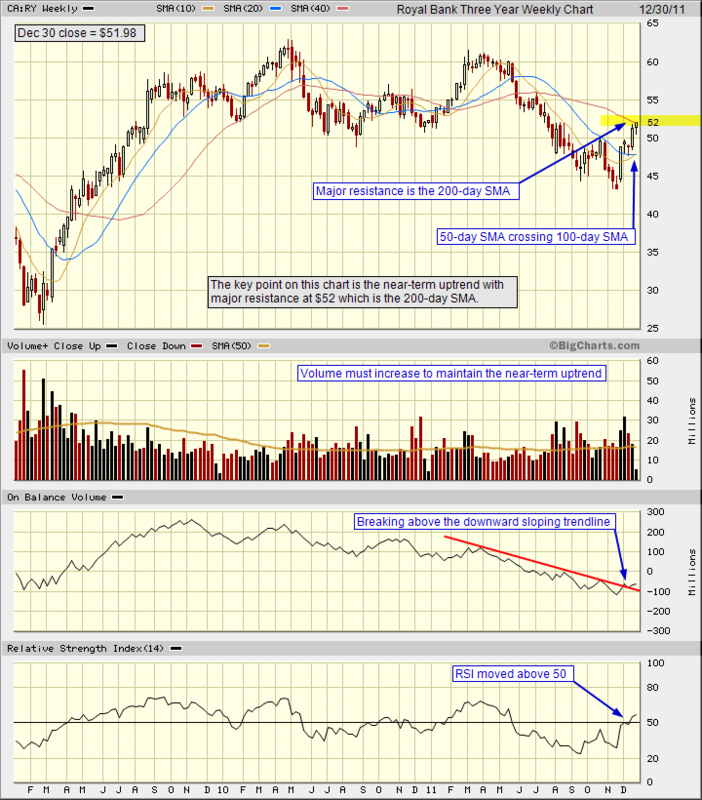 This entry was posted in Stocks and tagged candlestick chart, near-term trend, RBC, Royal Bank on January 2, 2012 by Trader.